Stanton T Smith, MD, Justin Lee, MD, Balaji Jangam, MD, Bruce Bernstein, PhD, Kristine O’Hara, MD, Ibrahim M. M Daoud, MD. Division of Minimally Invasive Surgery, Department of Surgery and Minimally Invasive Surgery Fellowship Program, Saint Francis Hospital and Medical Center, Hartford, CT, USA. INTRODUCTION- Appendectomy is one of the most common general surgical procedures performed. Although the open approach is the historic gold standard, laparoscopic appendectomy is performed more as surgeons acquire this skill. The next evolution to the laparoscopic approach has been the single incision technique. We sought to review one surgeons experience with the single incision technique. METHODS AND PROCEDURES- We performed a retrospective chart review of one surgeon’s experience from 2008-2010 at a university affiliated teaching hospital. Data collected included patient demographics, BMI, operative time, port additions, conversions, pathology, presence of occult umbilical hernias, complications, length of stay, 1-3 week, and 6 month follow up data. RESULTS-15 patients were identified. 9 (60%) patients were female. Mean age of 42 years (range 15-79). Mean BMI 24.7 kg/m² (range 20-34). Mean OR time 45.6 min (range 22-75). One acute perforation (0.067%), one appendiceal gangrene (0.067%), three with supprative appendicitis (20%), 7 acute appendicitis (47%), 2 had follicular lymphoid hyperplasia (13%), 1 with an appendiceal adhesion (0.067). 4 (27%) patients were found to have an umbilical hernia at time of surgery. There were no conversions, but 2 (13%) patients required one extra port (one 2mm, one 5 mm). Length of stay: 12 (80%) patients discharged on same day (<24hr), 2 patients stayed 1 day, 1 patient stayed 2 days (acute non-perforated appendicitis, but aged 79 years). All, but one patient, were seen at 2 weeks in the office. Average days of narcotic use was 1.4 days (range 0-4d), mean days to return of normal activity was 2 days (range 1-4d). There were no complications or readmissions within 30 days. No patient reported any complications or symptoms of hernia at 6 month follow up. 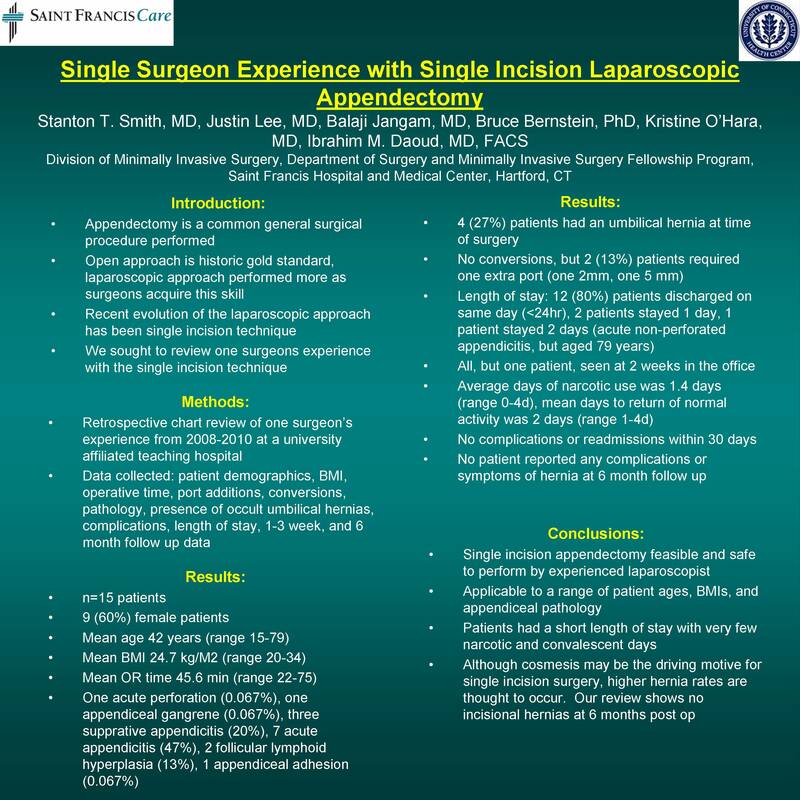 CONCLUSION(S)- Single incision appendectomy appears to be feasible and safe to perform in the hands of an experienced laparoscopist. It is applicable to a range of patient ages, BMIs, and appendiceal pathology. Our patients had a short length of stay with very few narcotic and convalescent days. Although cosmesis may be the driving motive for single incision surgery, higher hernia rates are thought to occur. Our review shows no incisional hernias at 6 months post op.